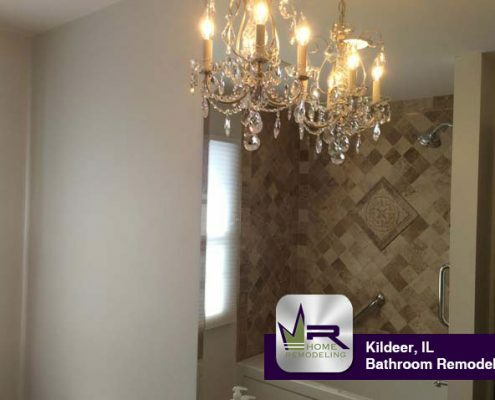 This beautiful property is situated in Kildeer between the intersections of East Main Street and North Quentin Road and West East Cuba Road and South Krueger Road. 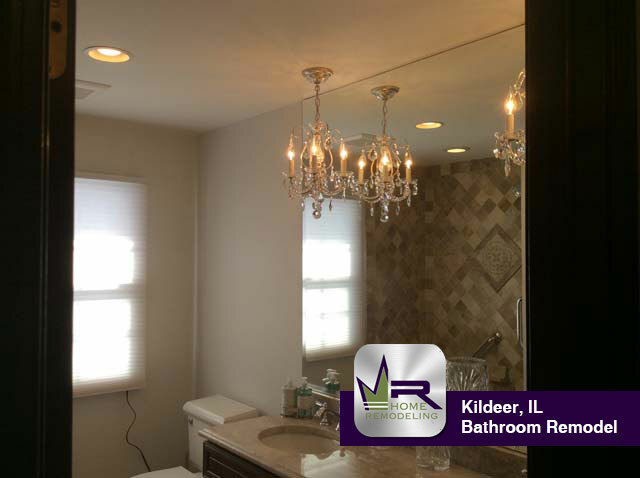 Kildeer is known for its natural beauty and large lots with a population of less than 4,000 residents according to the 2010 census report. 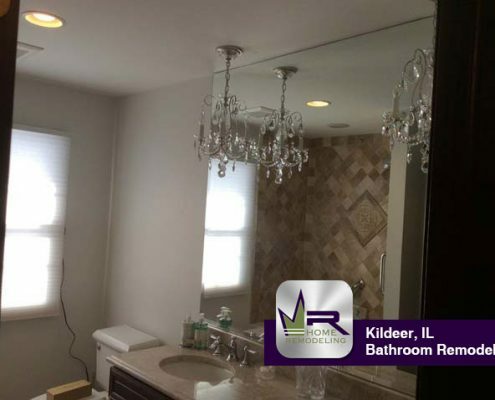 It has been recognized as one of the top suburbs in which to live based on several factors including: education, transportation, crime, services, and more. 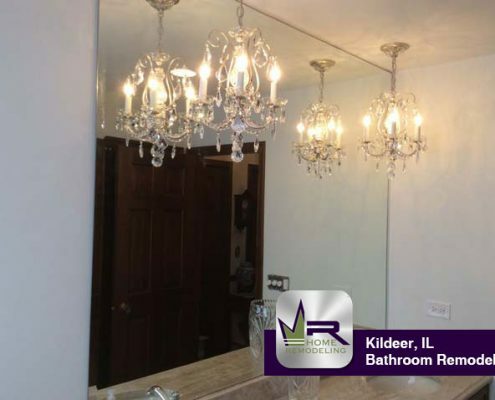 Some of the popular locations for food around here include: Rosati’s Pizza, Hunan Wing, Sergio’s Fresh Mexican Grill, Rics Dine In-Dine Out, UnWined of Long Grove, ClayOven Tandoor Indian Grill, and more. 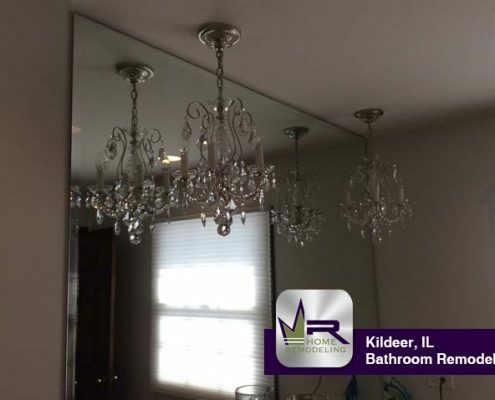 For shopping, residents often visit places like: Paddy’s On the Square, Olivia’s Past, Bella Donna Boutique, Deer Park Town Center, Nordstrom, Stein Mart, and more. 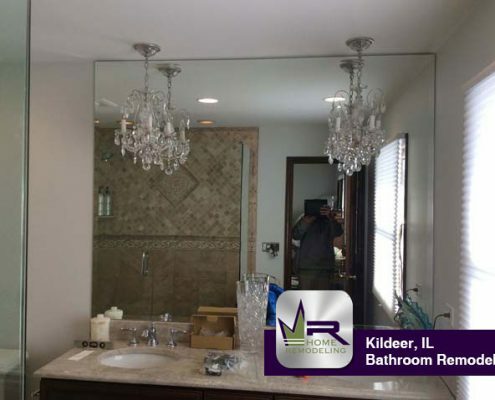 The owners of this beautiful home had some big changes in mind for their master and hallway bathrooms. 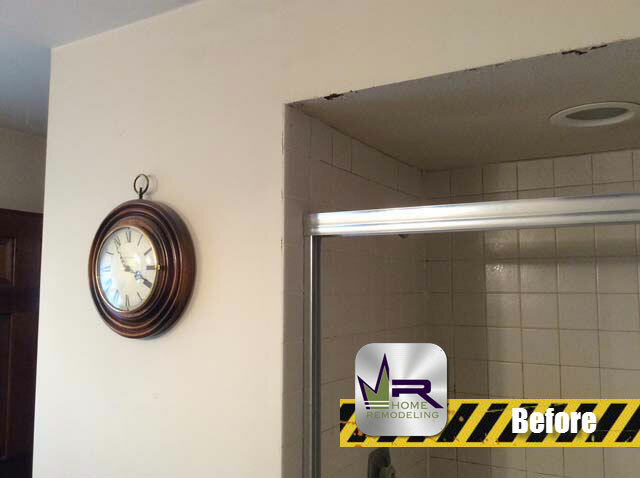 They wanted to essentially maintain the same layout for both rooms, but change every other aspect of both spaces. 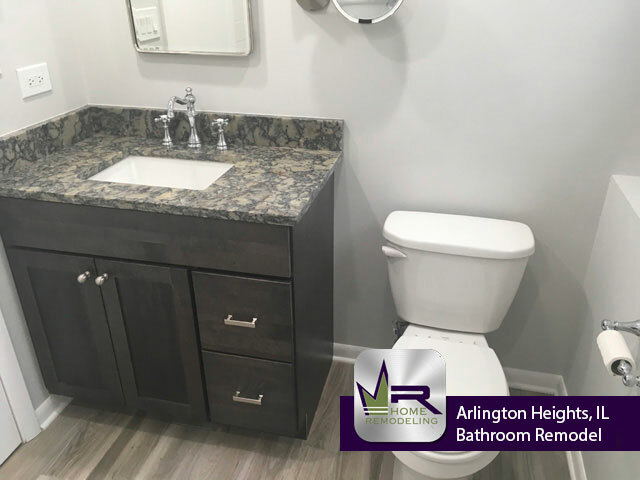 In order to successfully make these changes, Regency began with the demolition and removal of existing: cabinetry, fixtures, flooring, walls, and any damaged subfloor. 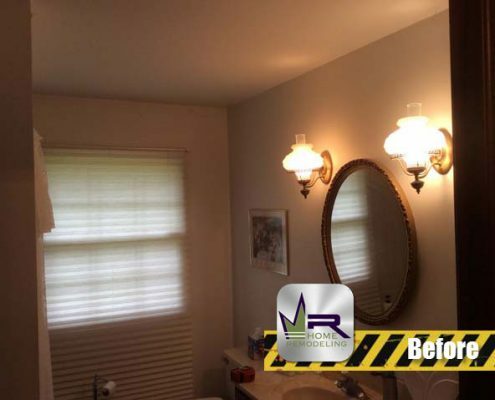 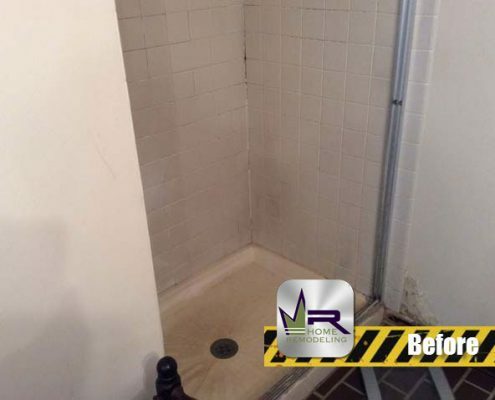 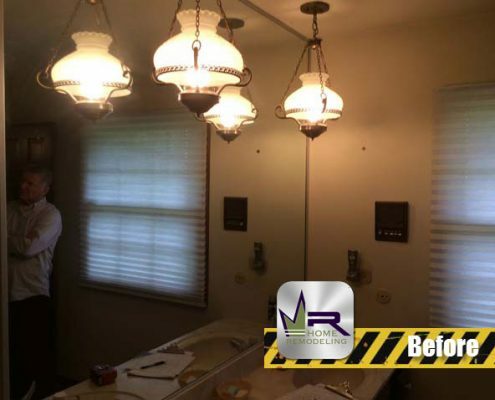 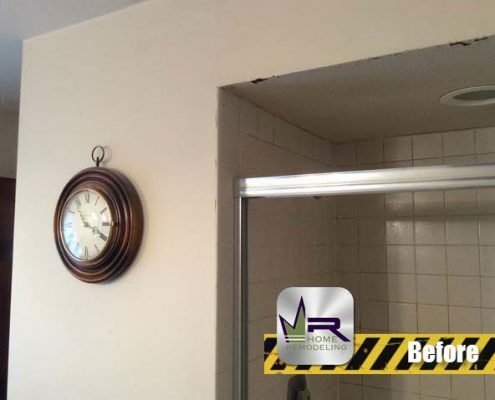 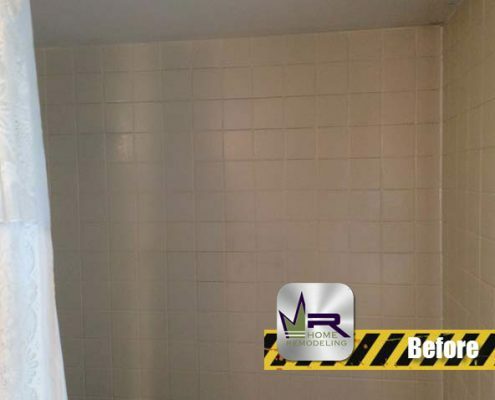 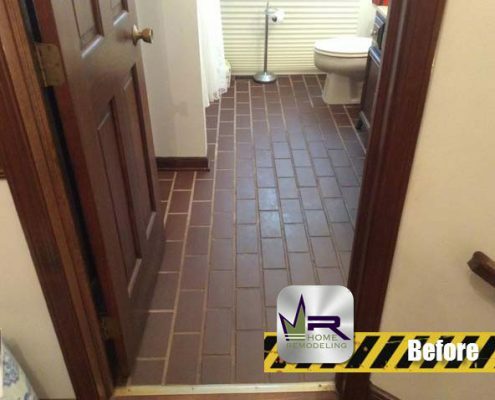 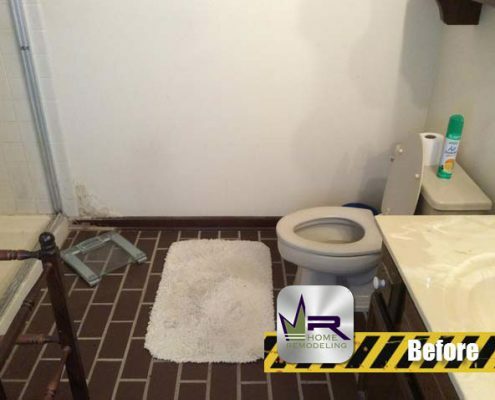 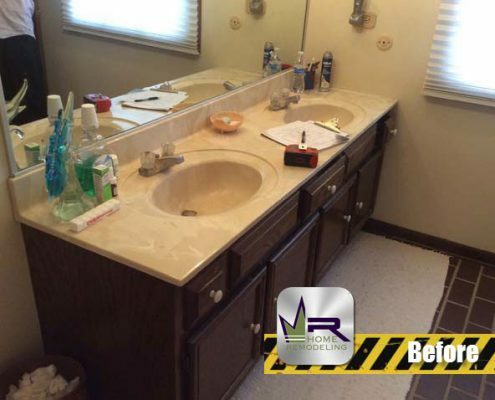 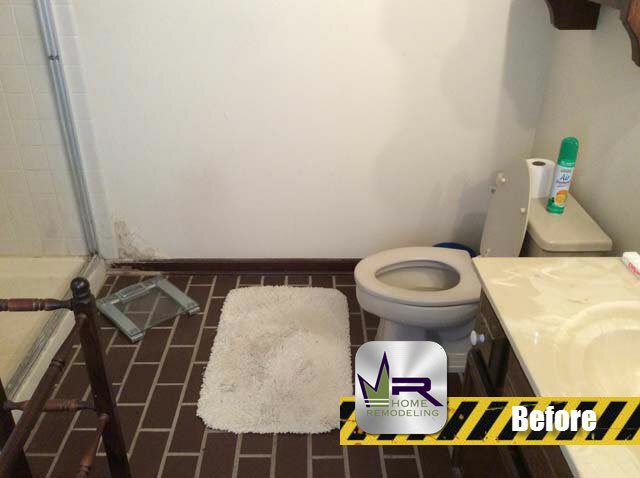 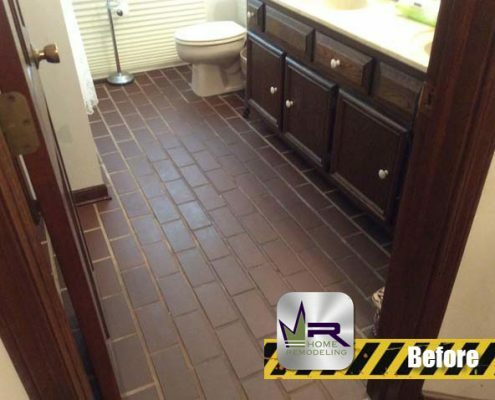 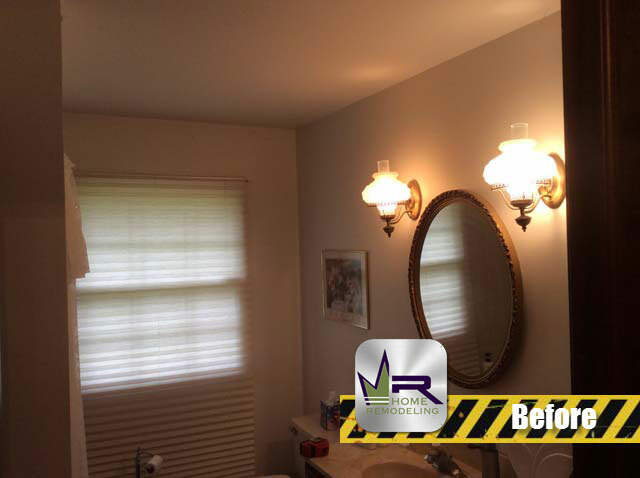 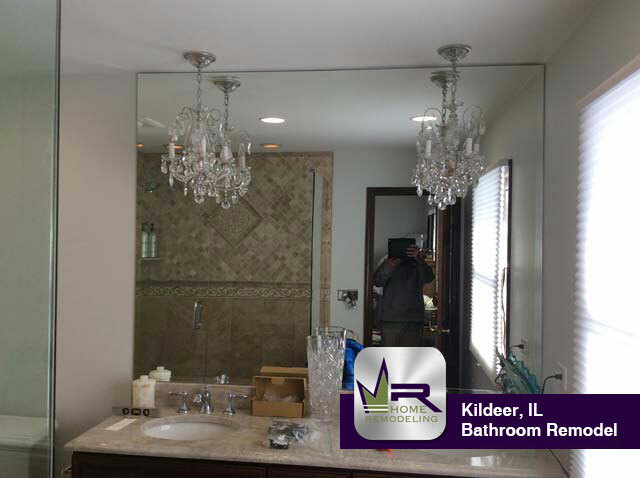 In the master bathroom, they wanted to make another big change that would significantly increase the perceived size of the area and make the room feel much more spacious. 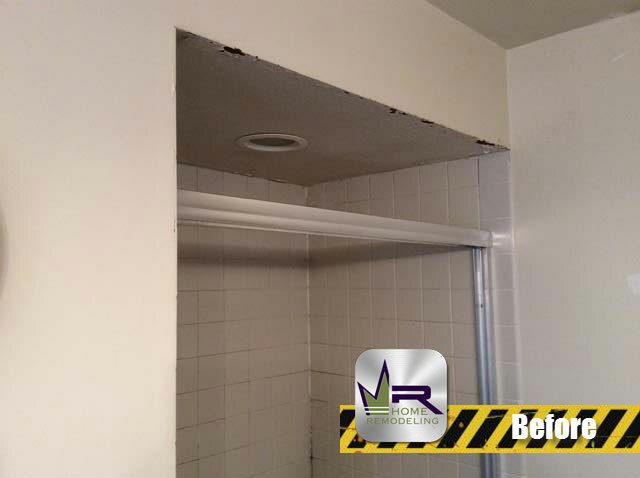 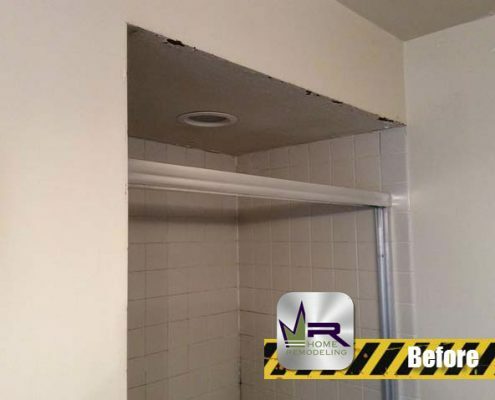 This change was the removal of the linen closet that was placed between the shower area and the entrance into the bathroom. 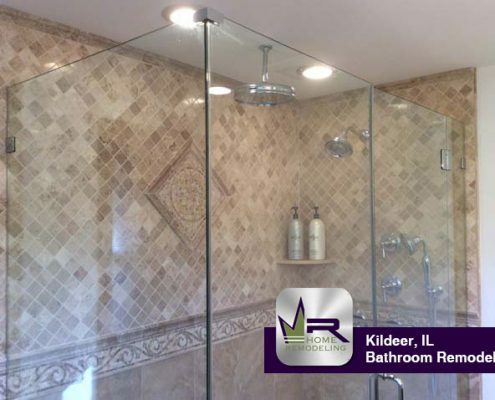 This change would allow for the shower size to be increased as well as making the shower space feel like crammed by replacing the walls with glass doors. 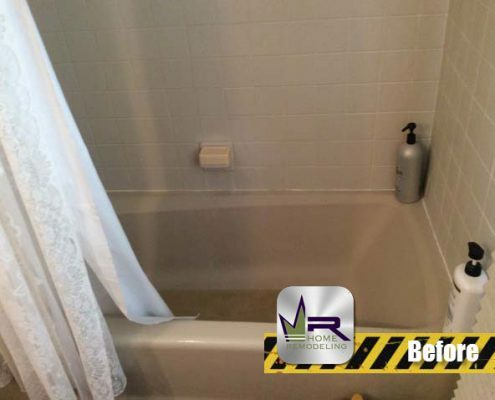 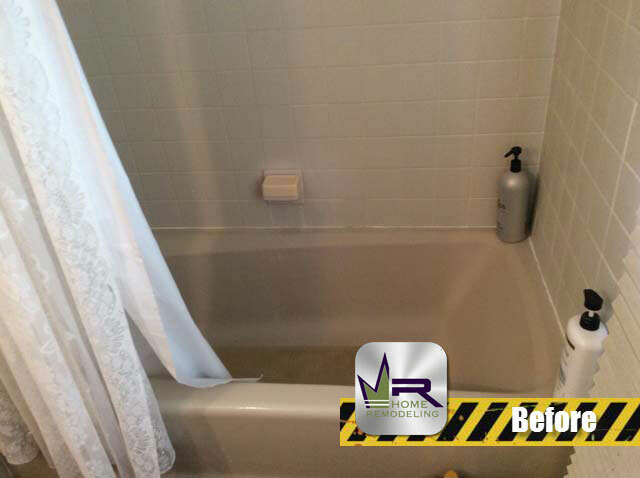 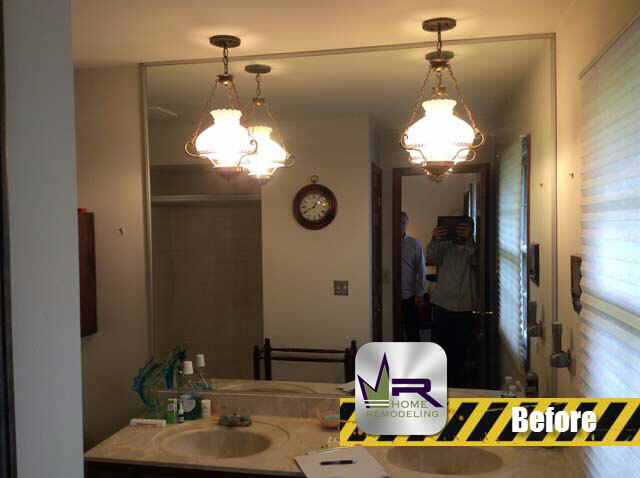 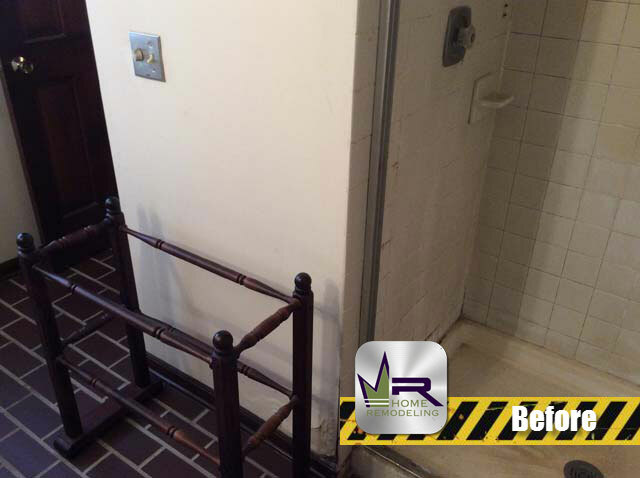 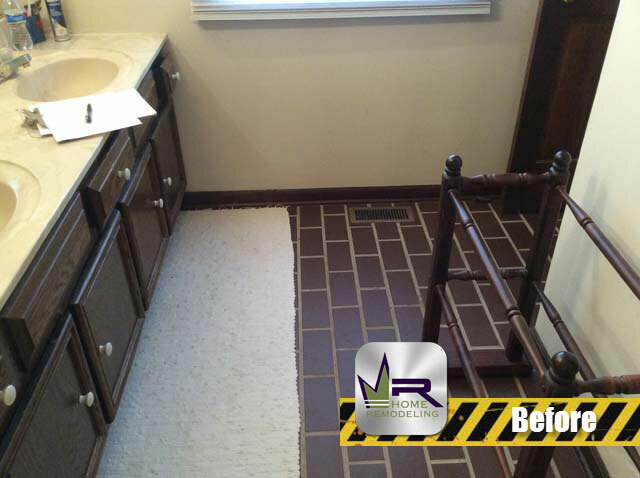 The master bathroom was the sight of more dramatic changes. 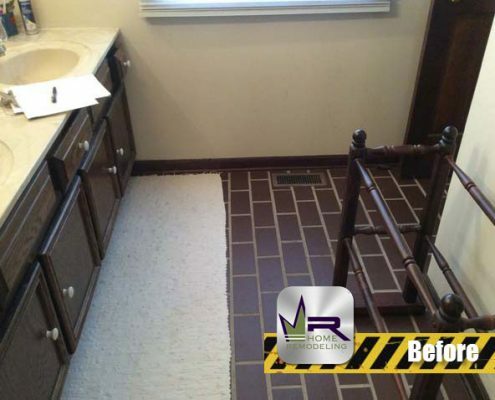 The removal of the linen closet was an excellent idea that made all the difference in the world in terms of space and layout of the room. 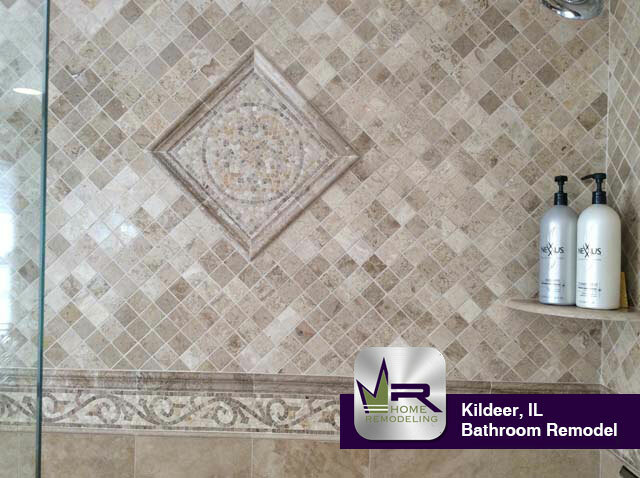 This accomplished the main goal of the master bathroom, which was to make the space more efficient and practical. 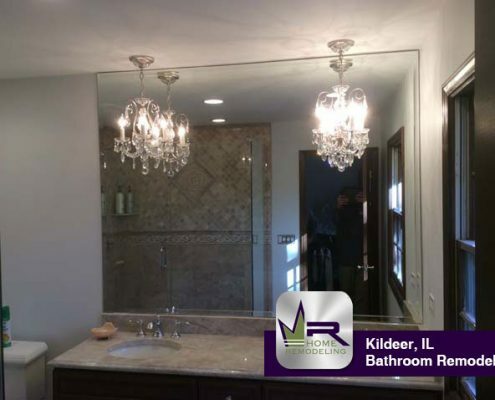 The hallway bathroom was significantly changed as well, but more in terms of style than layout. 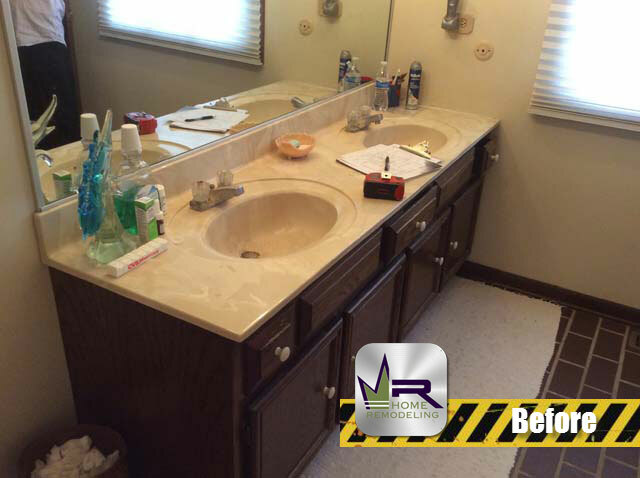 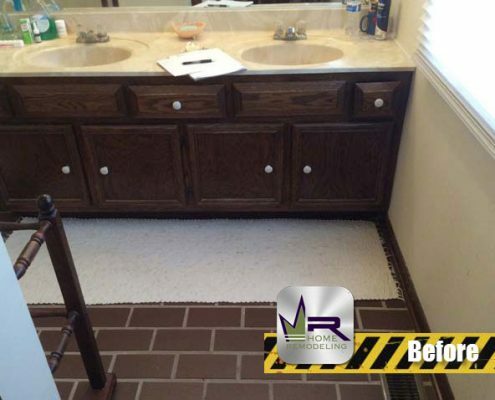 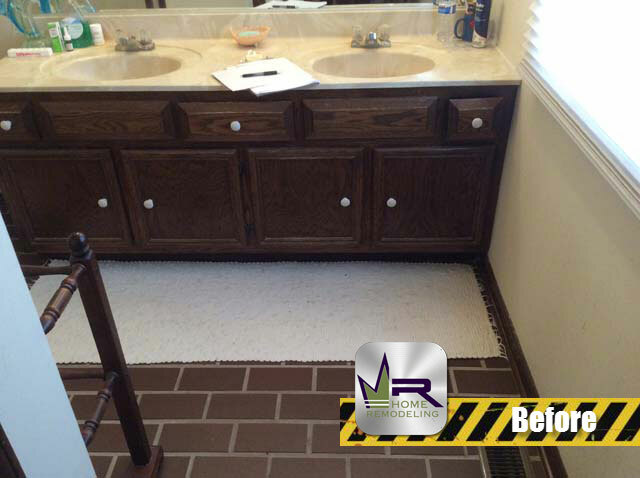 The small vanity mirror that had previously occupied the area above the vanity was replaced in favor of a much larger one, which enabled Regency to install a two-sink vanity where there had previously only been one. 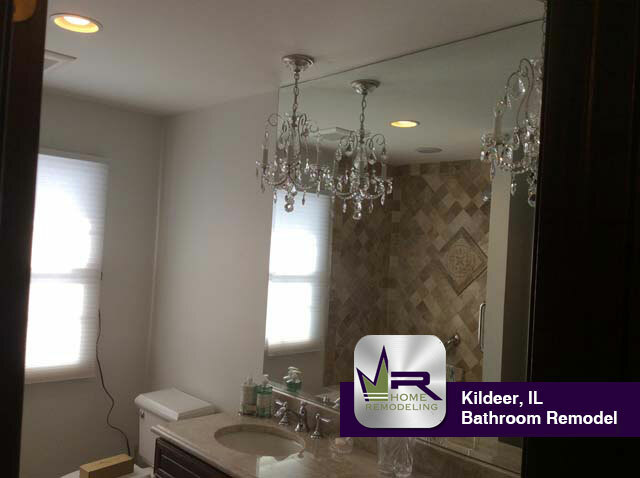 Both bathrooms finishes were matched for uniformity and are both very tasteful. 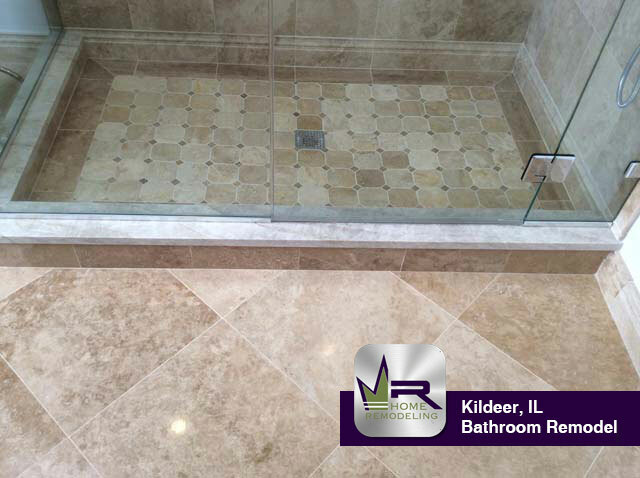 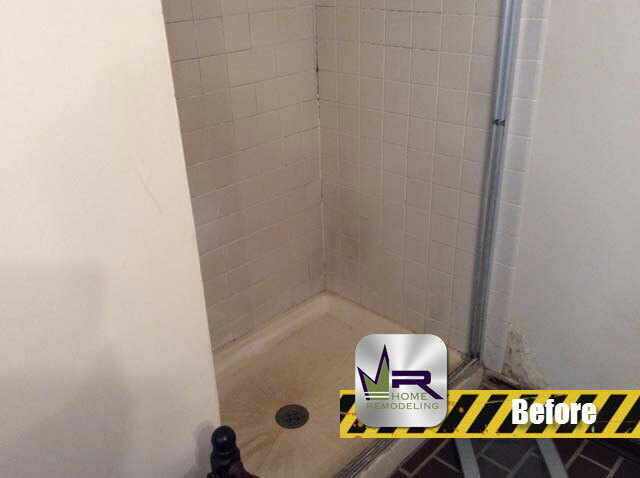 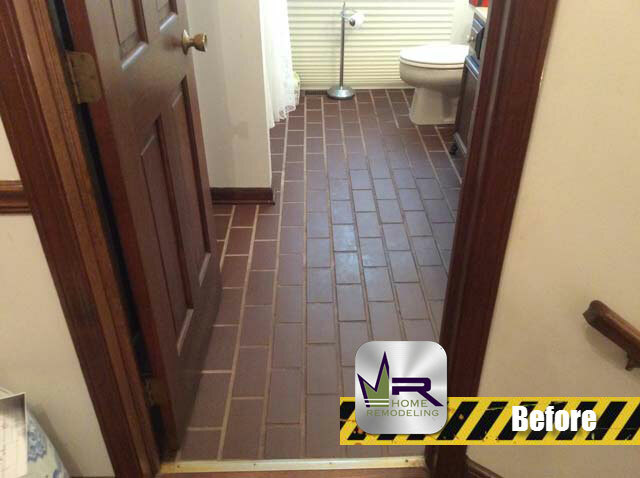 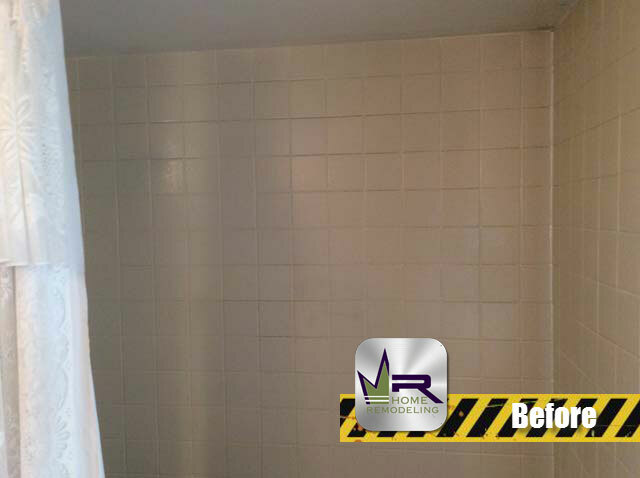 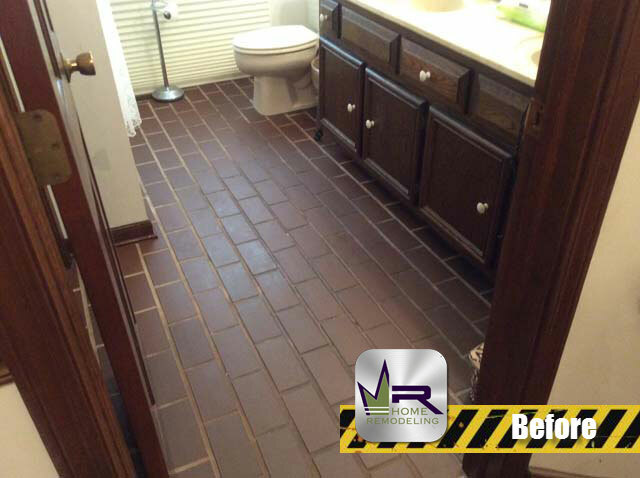 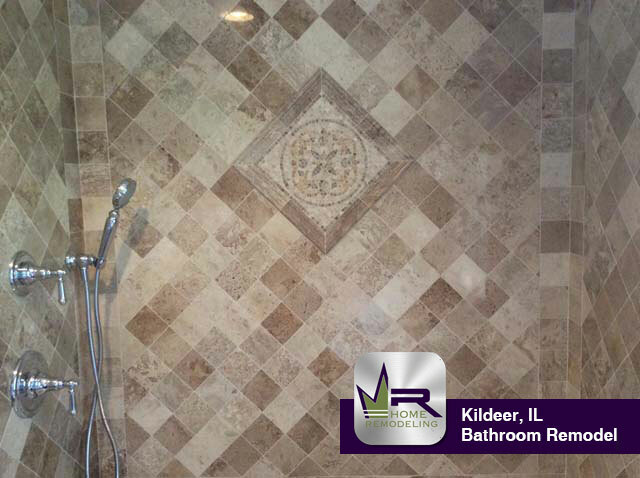 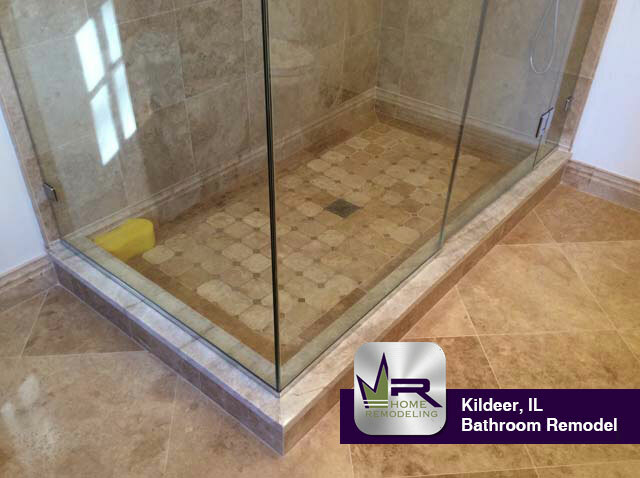 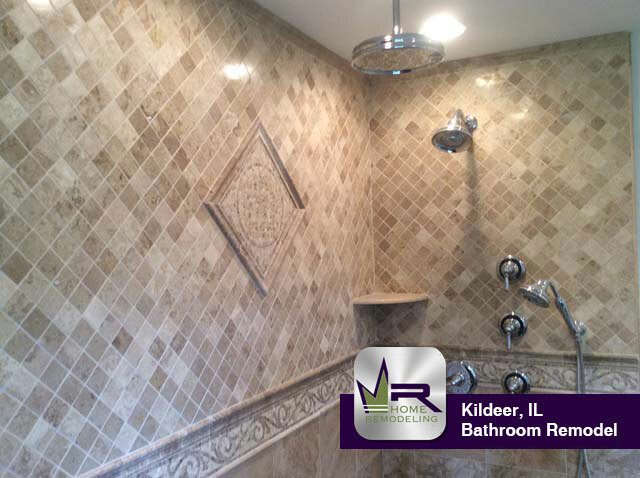 The master bathroom has tile flooring in the shower, but that is the only real difference in terms of finishes. Both shower area walls were finished with a Bucak Walnut finish from The Tile Shop and were beautifully decorated to form a beautiful design. 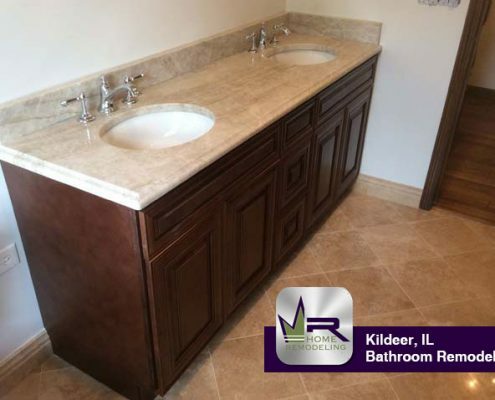 The flooring of both bathrooms was also fitted with a polished Bucak Walnut finish in order to match the shower walls and the Taj Mahal countertops of the vanities. 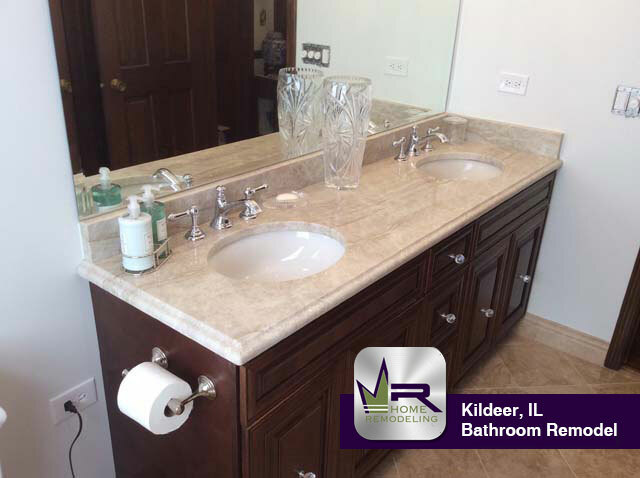 White fixtures like the Kohler toilet and BainUltra bathtub were installed to increase the brightness of the space and were contrasted by the Chocolate Maple Glazed cabinetry of the vanities. 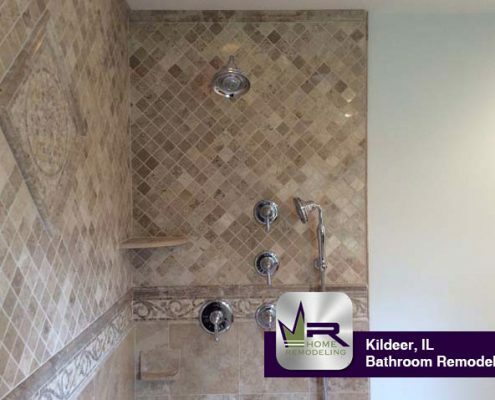 The showers and sinks were both equipped with premium, polished chrome fixtures such as the Kohler showerheads, handshowers, and lavatory faucets. 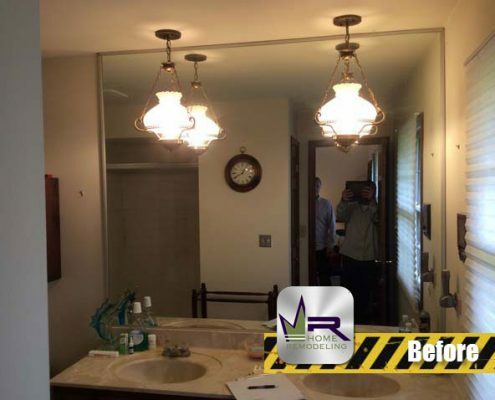 Overall, these new spaces are works of art. 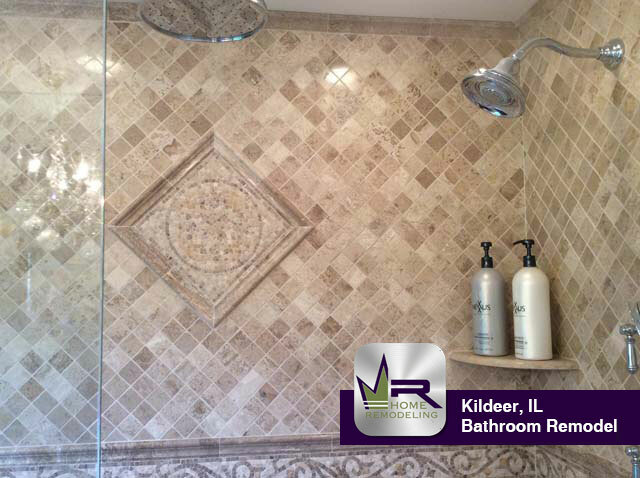 The design of the shower walls is very tasteful and artistic and the color schemes of the bathrooms are very warm and inviting. 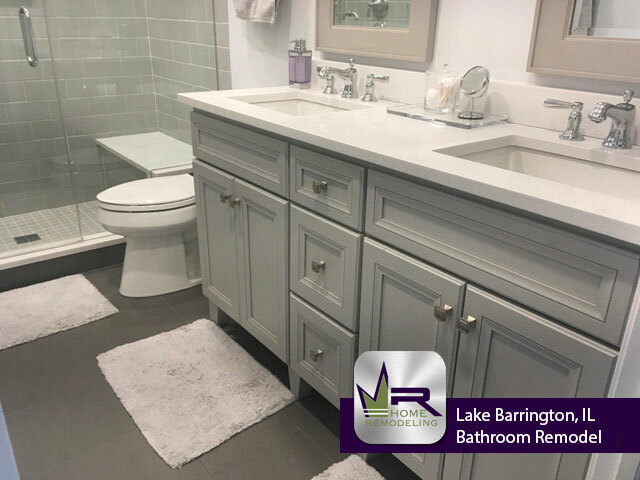 The uniform finishes of both bathroom spaces help the house maintain an elegant and luxurious style. 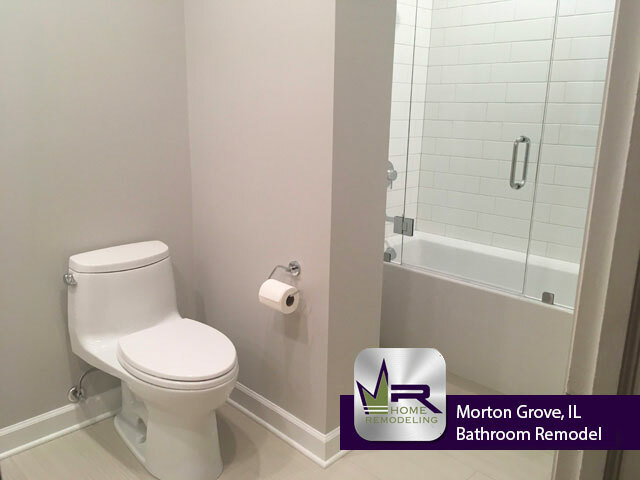 These bathrooms will be a joy to use and a great way to start any person’s day! 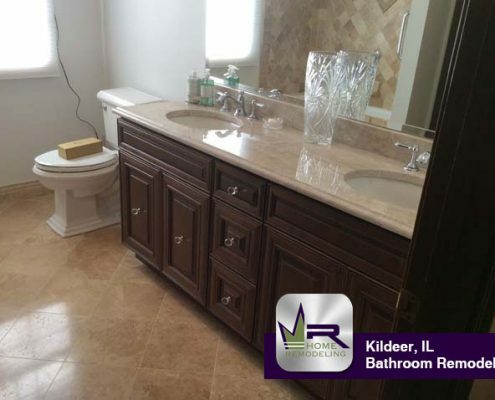 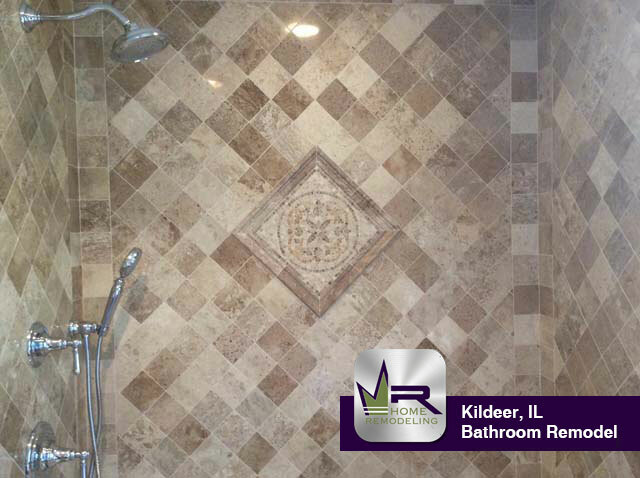 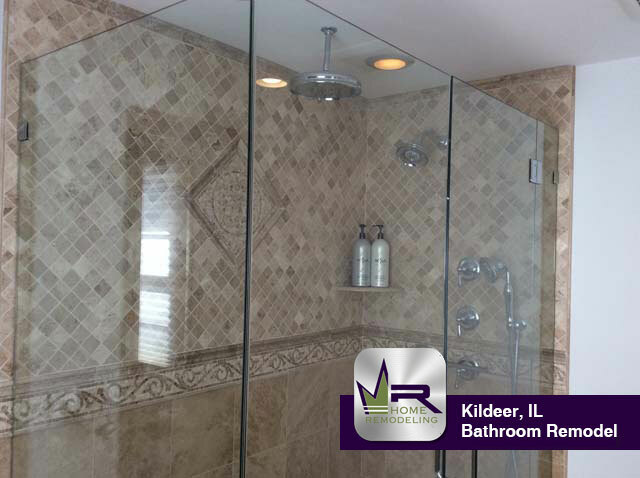 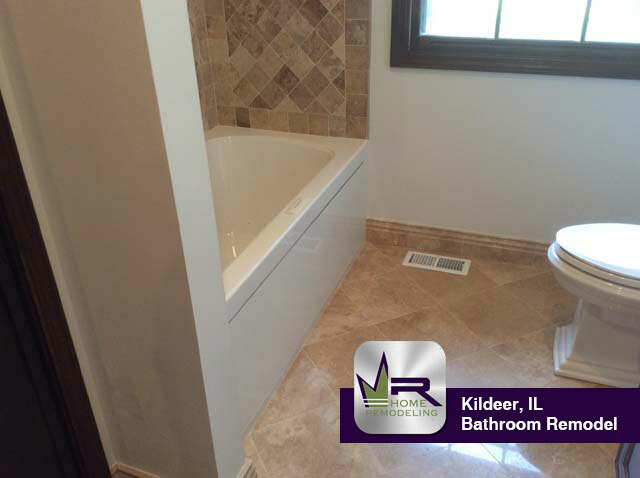 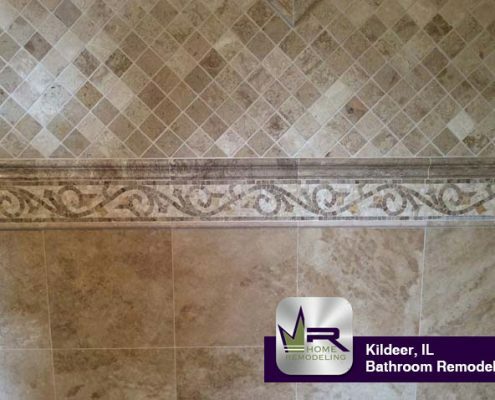 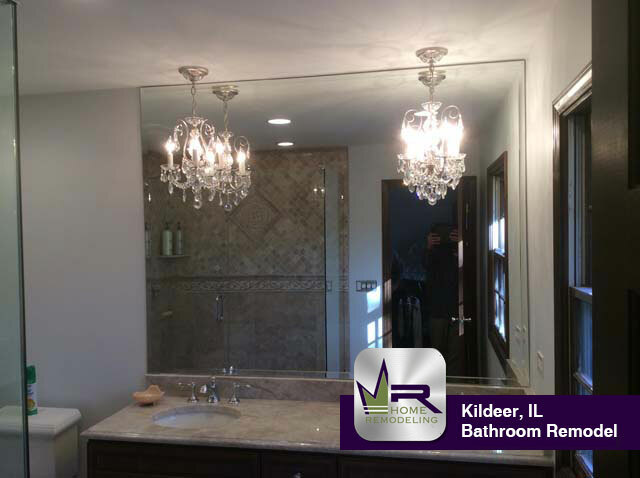 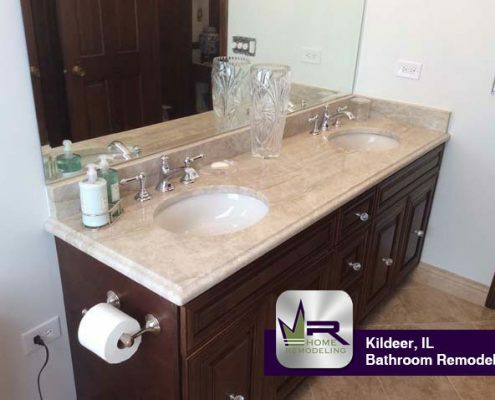 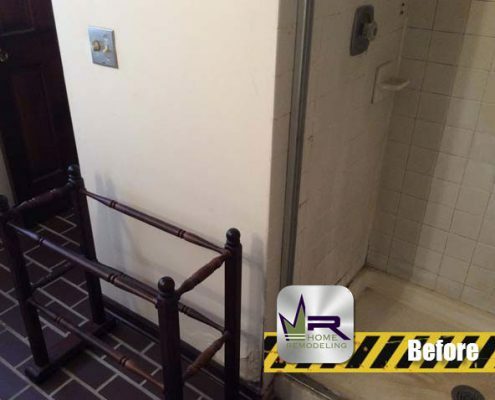 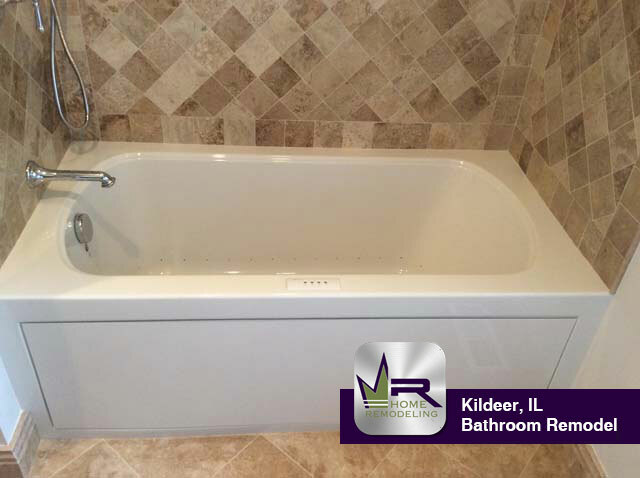 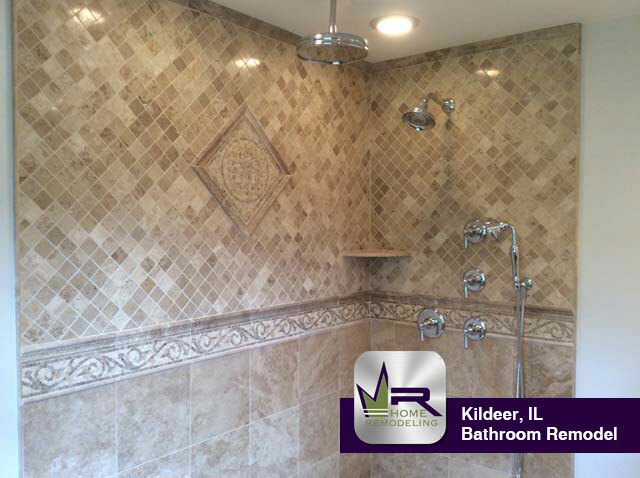 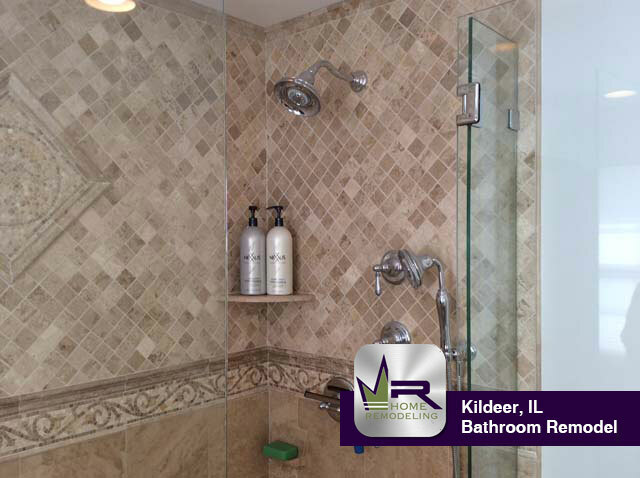 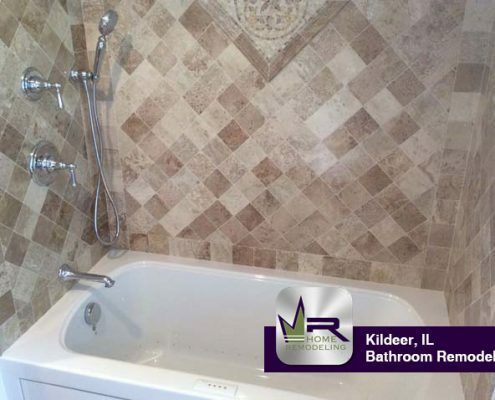 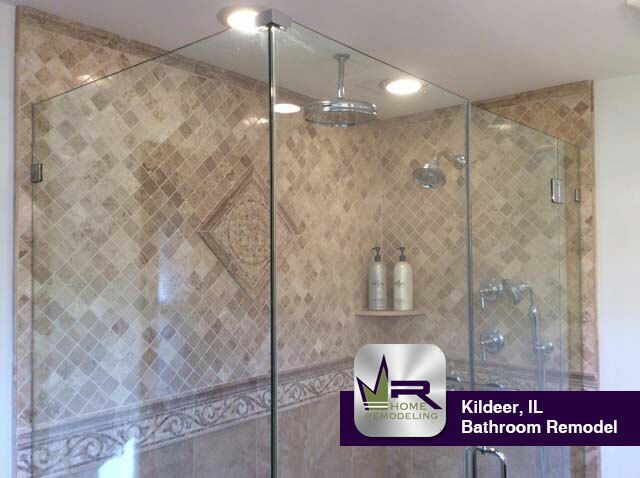 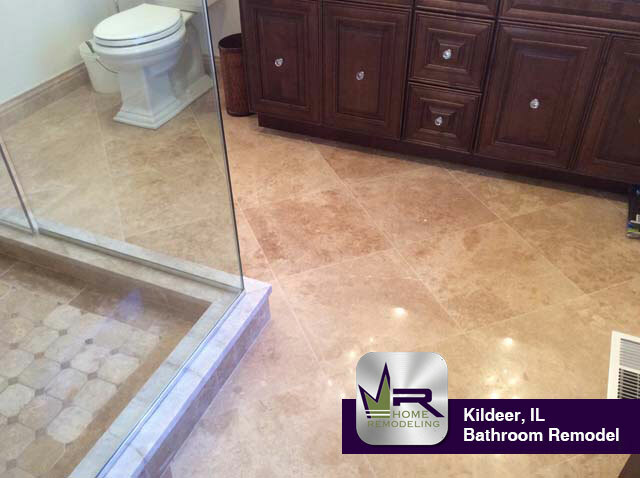 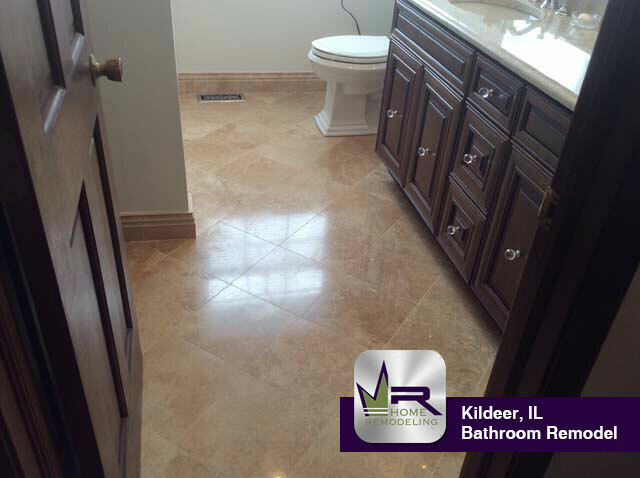 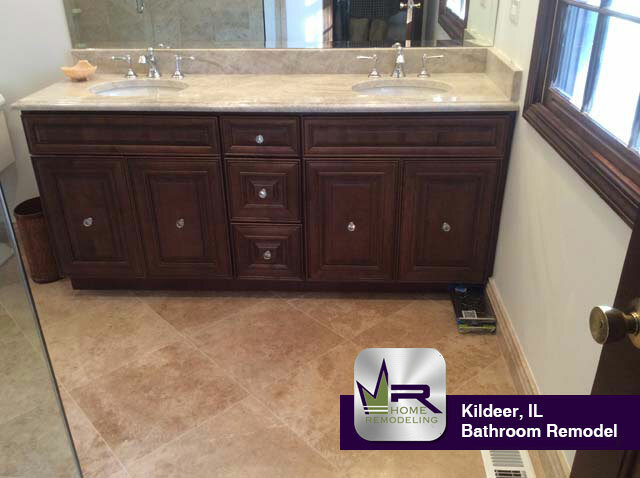 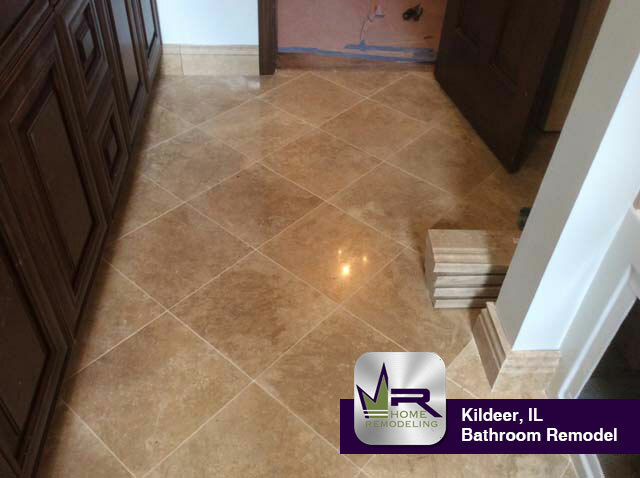 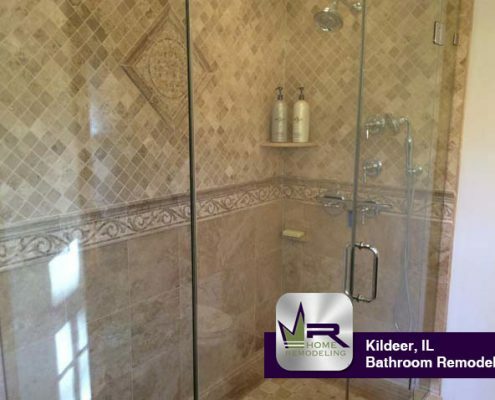 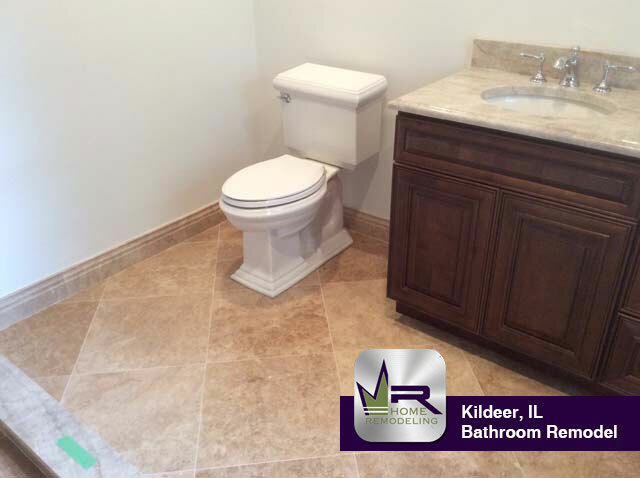 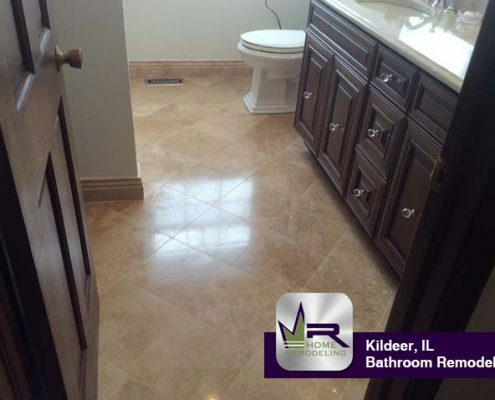 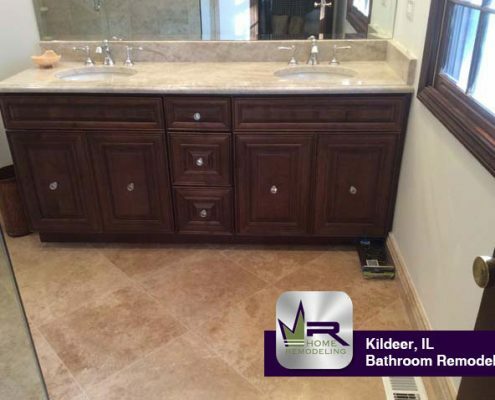 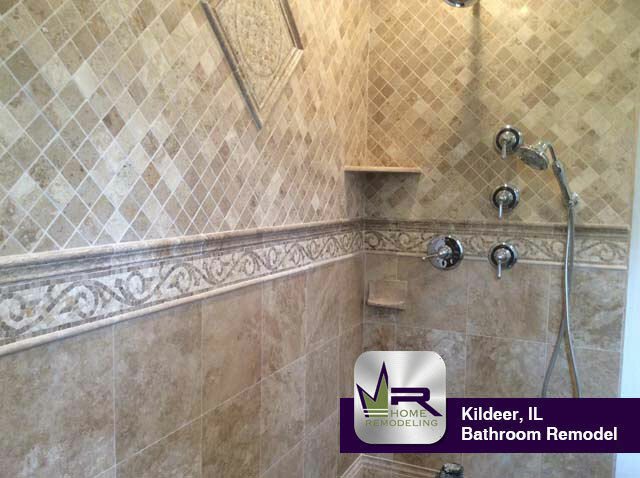 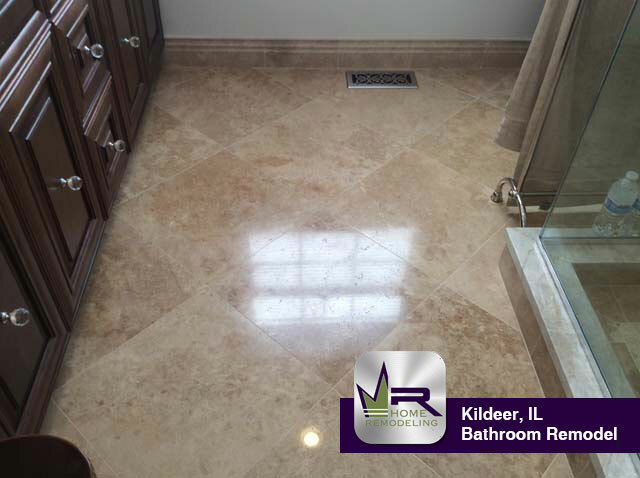 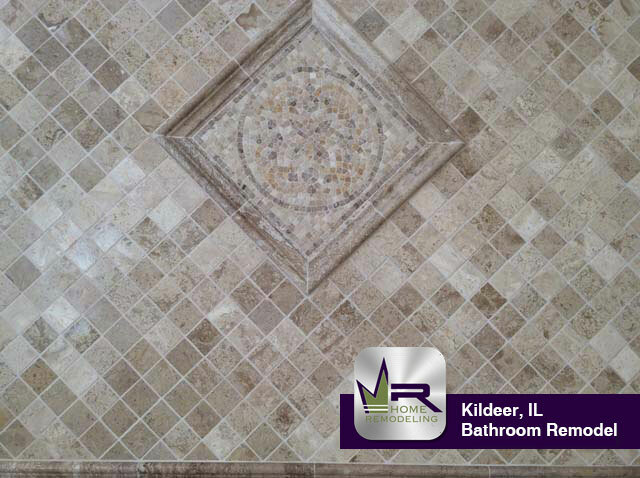 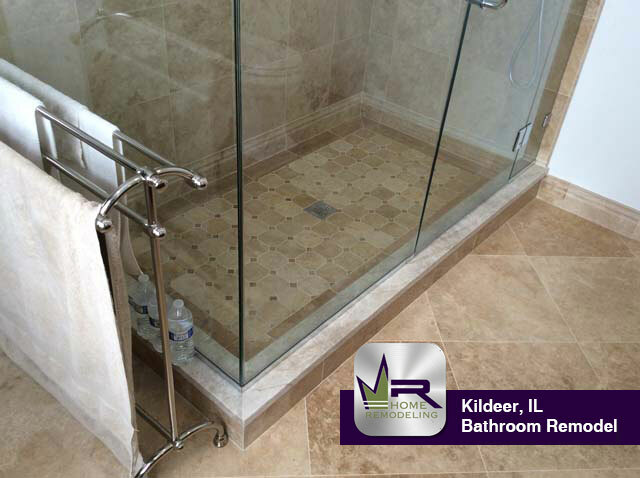 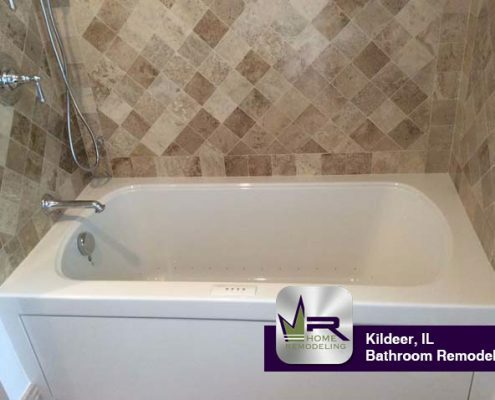 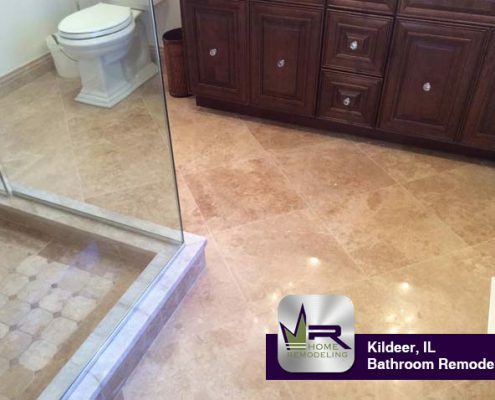 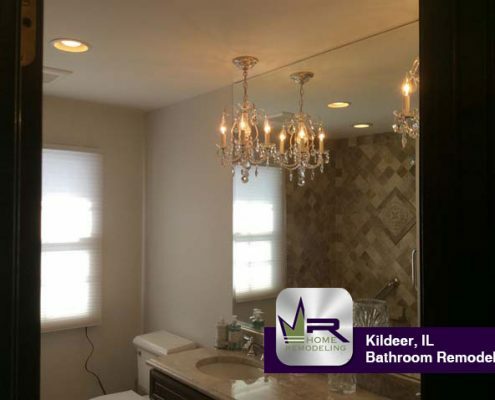 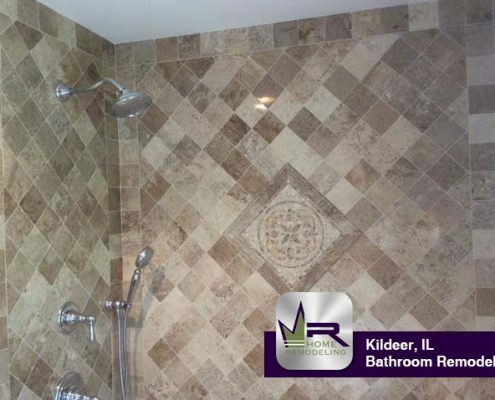 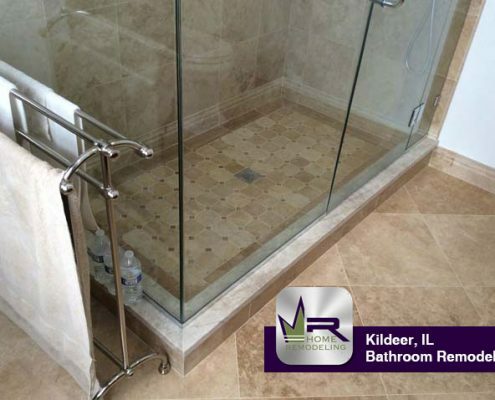 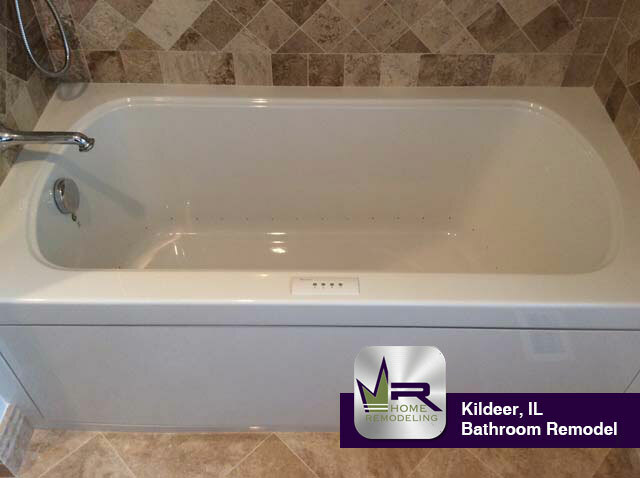 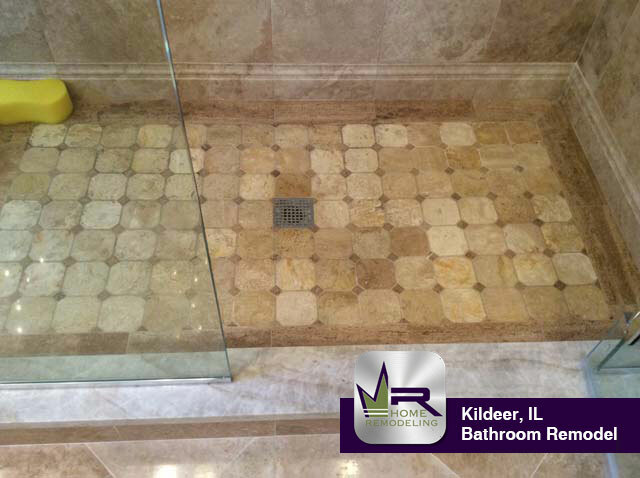 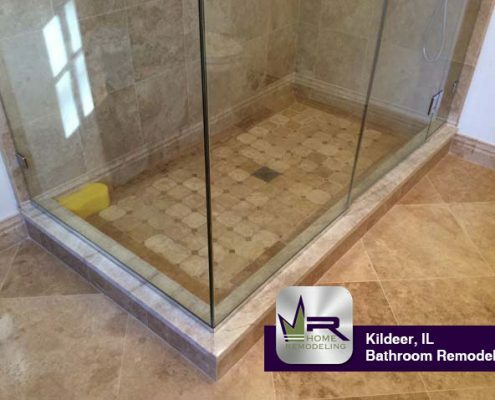 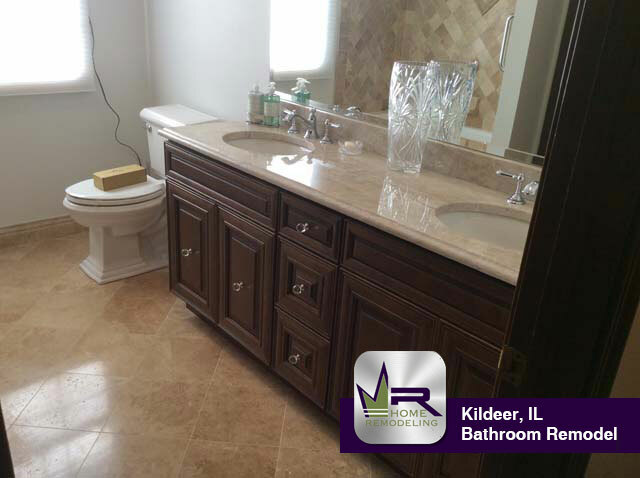 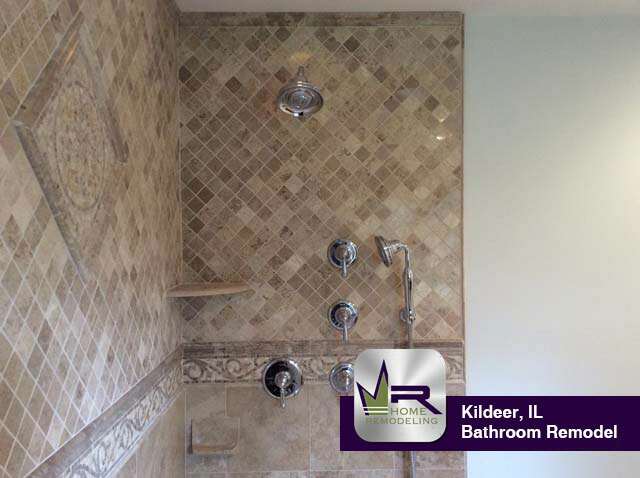 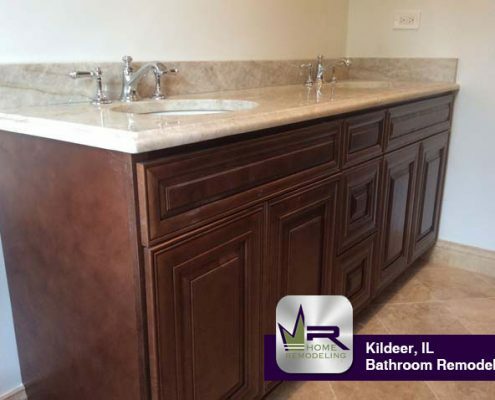 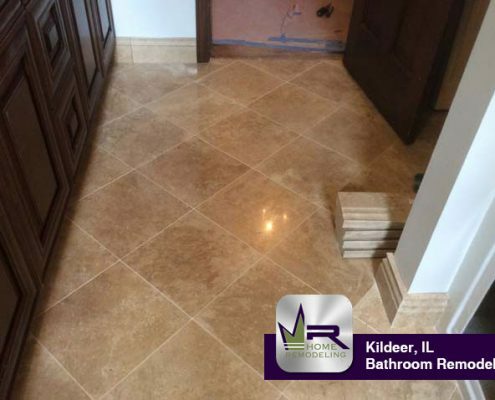 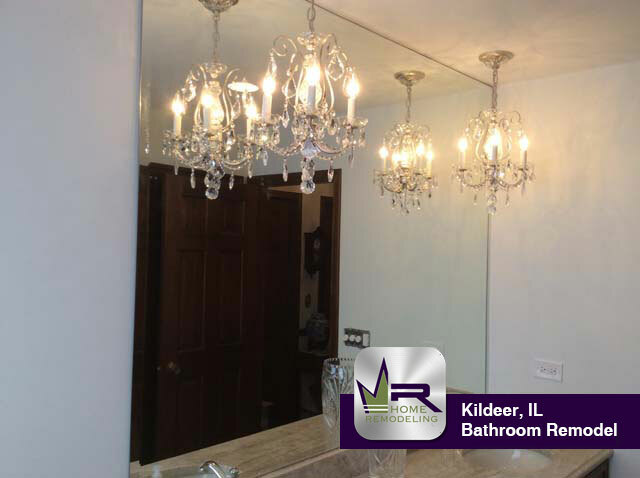 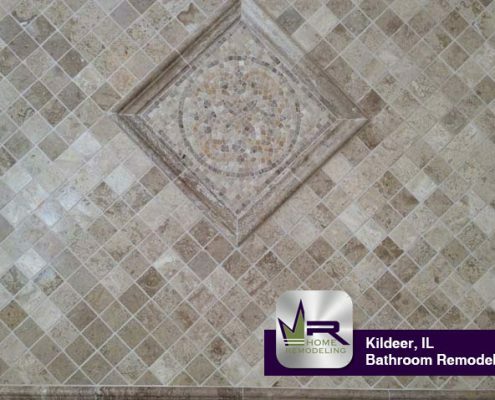 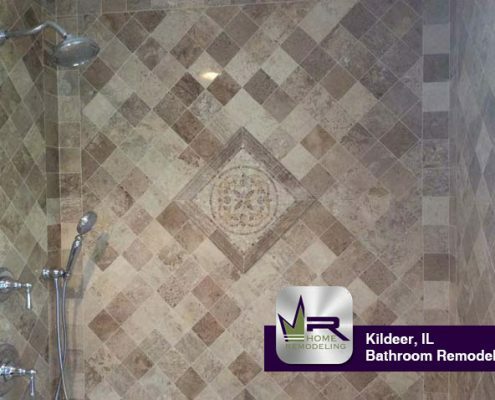 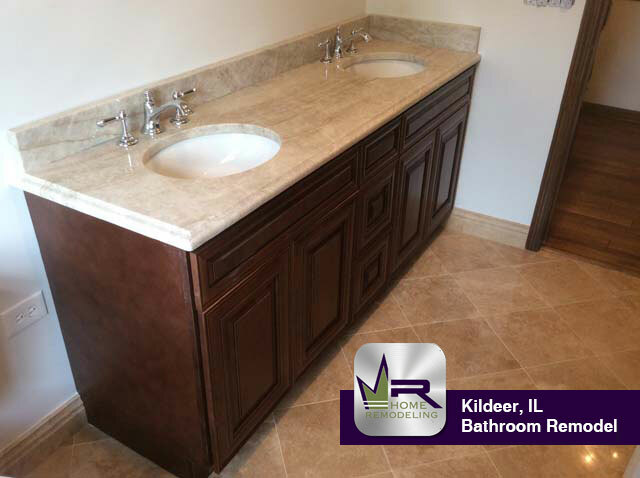 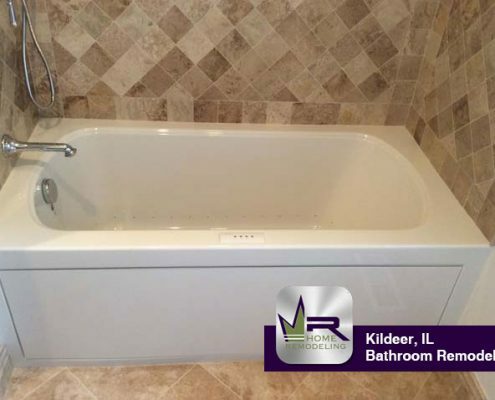 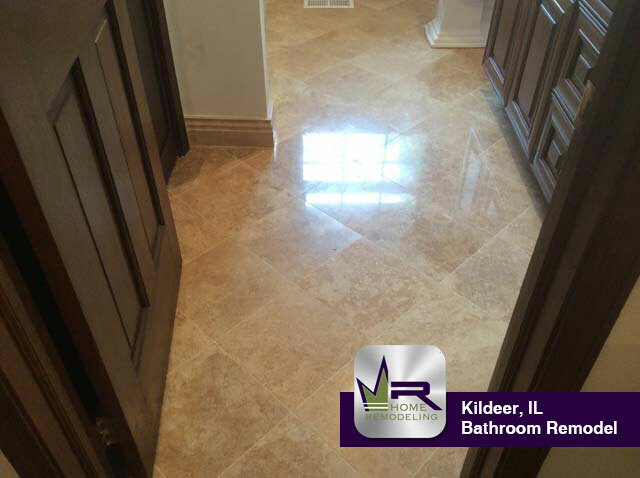 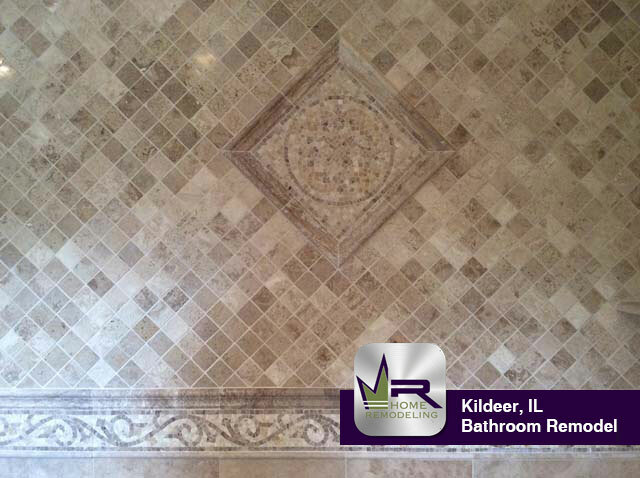 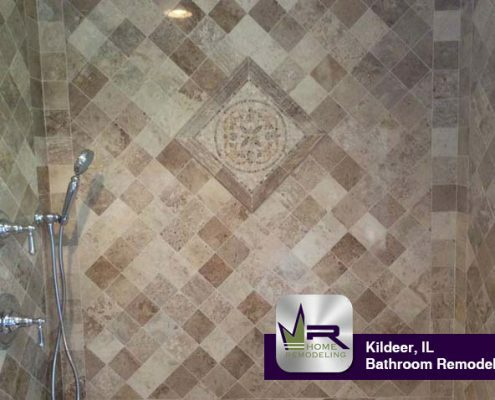 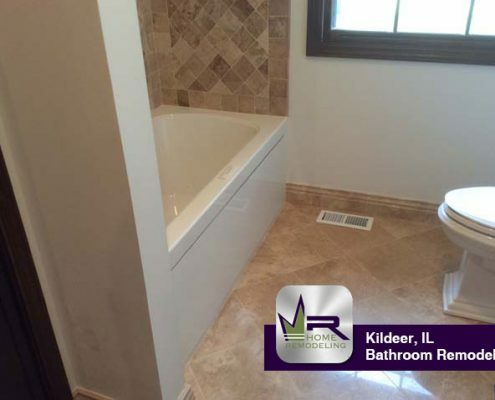 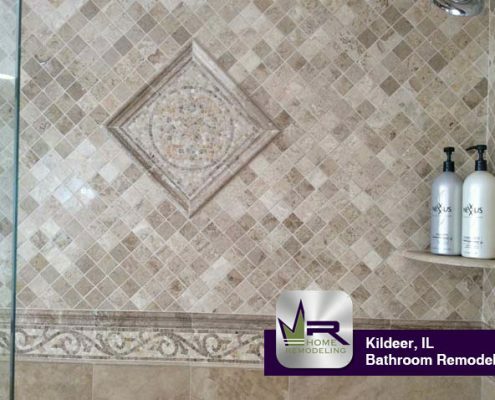 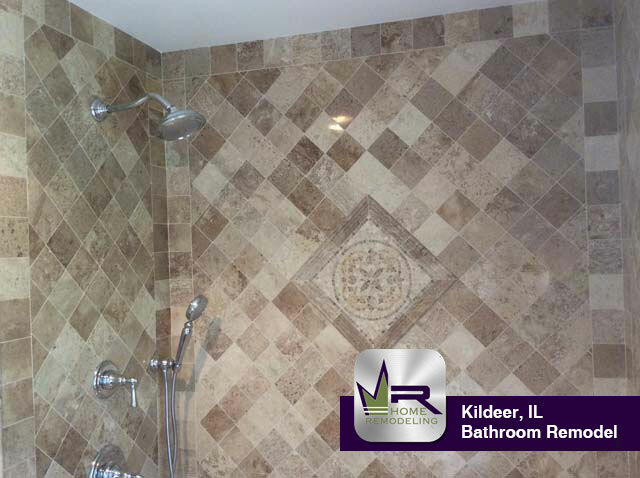 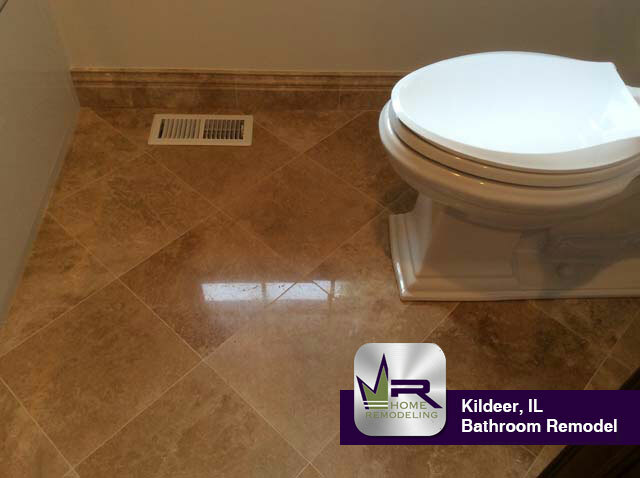 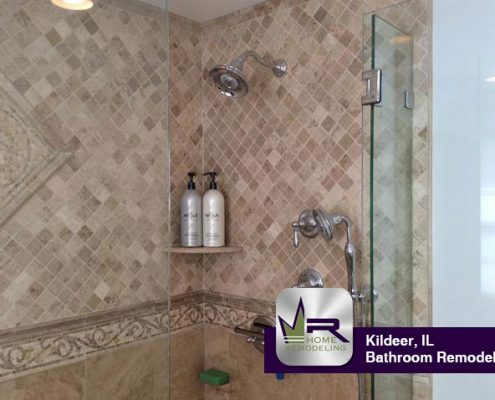 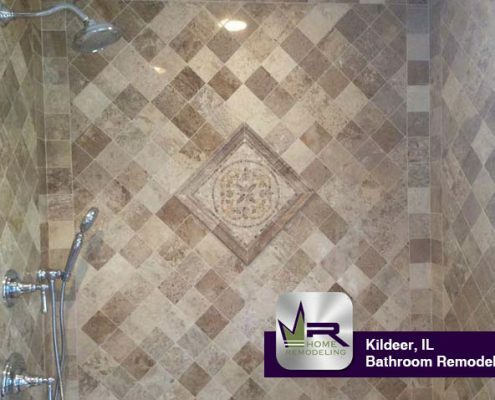 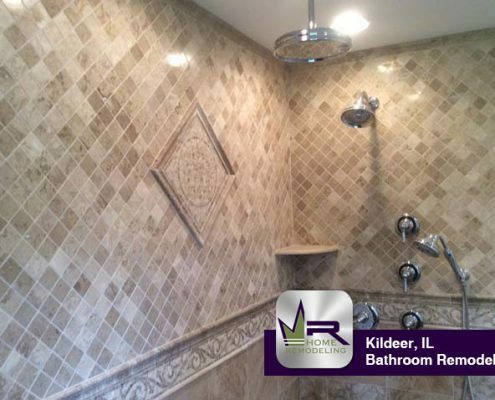 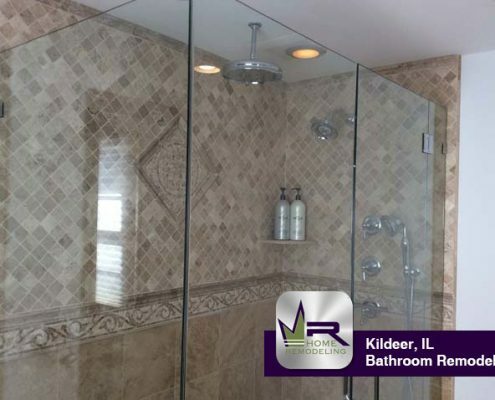 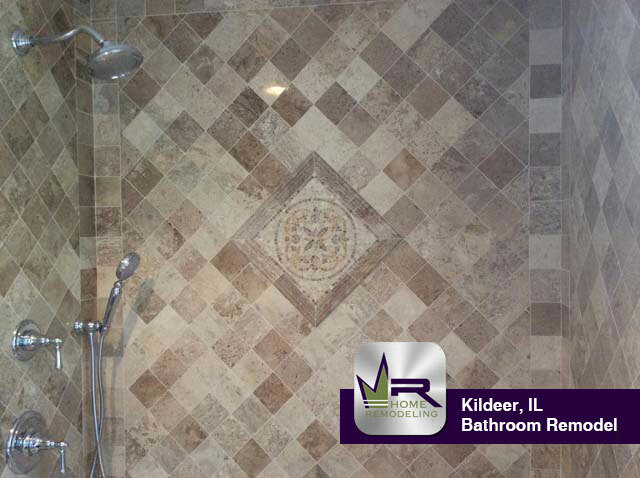 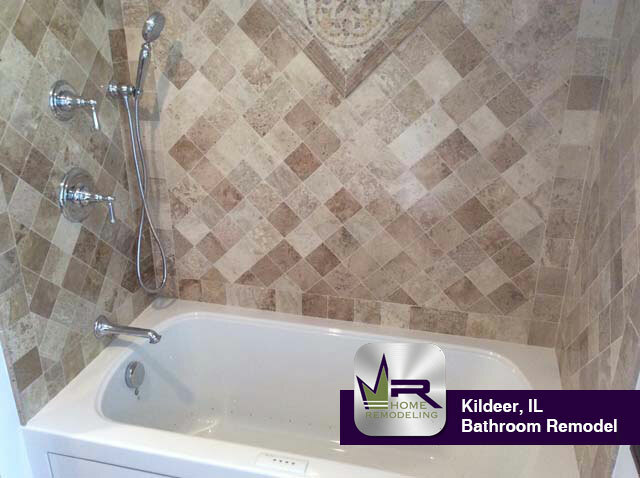 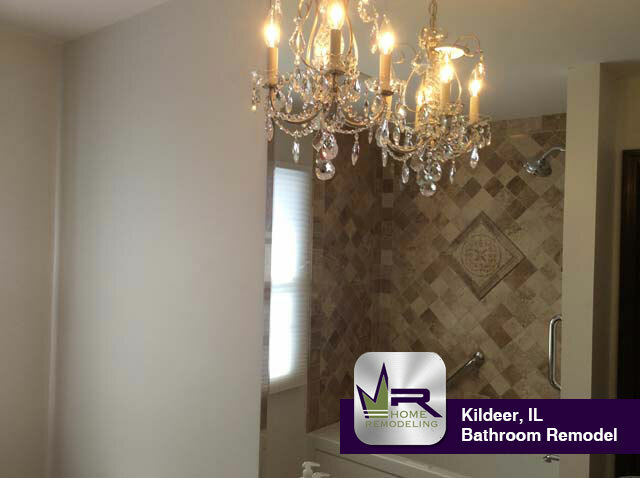 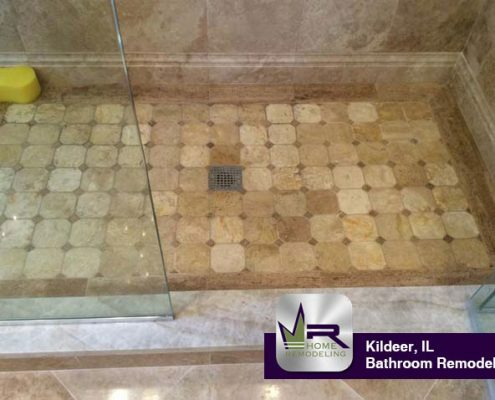 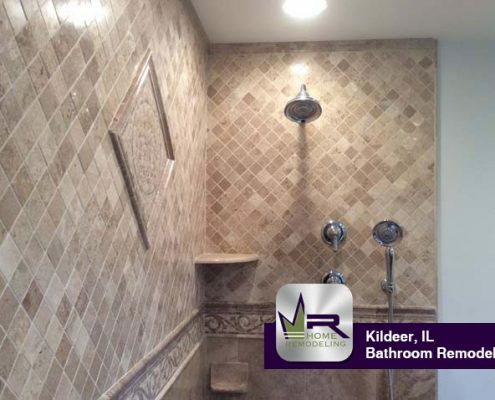 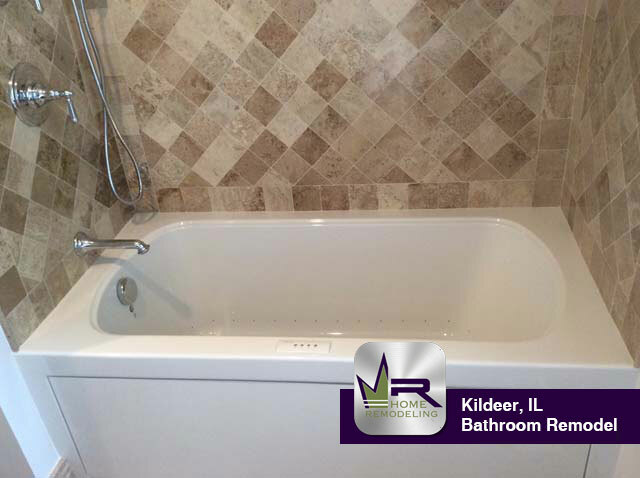 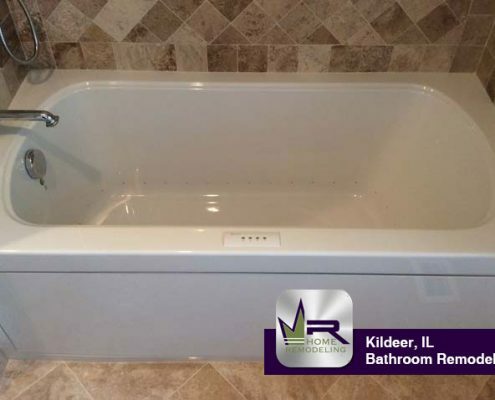 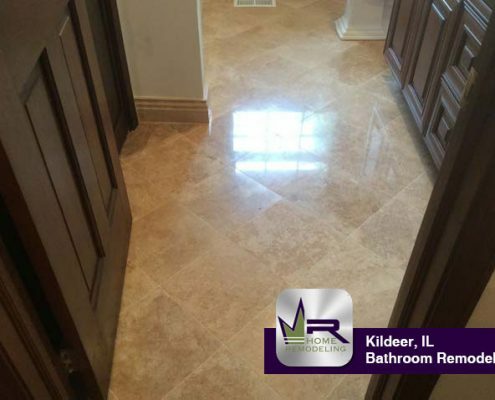 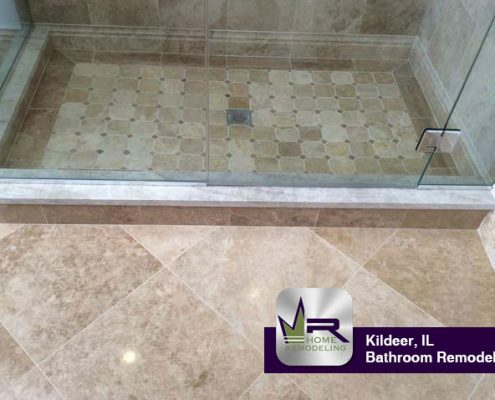 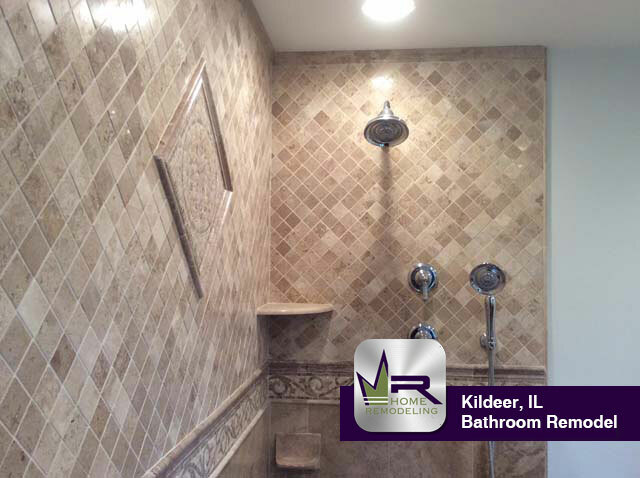 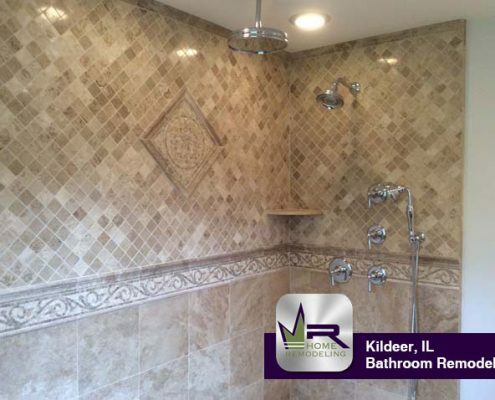 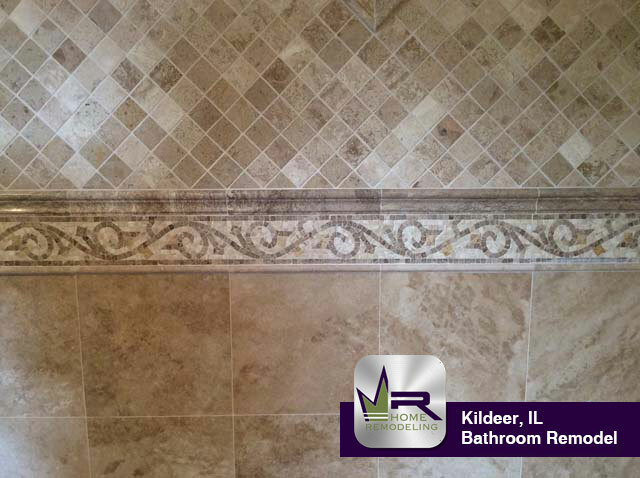 If you want a bathroom remodel in Kildeer, IL call the experts in home improvement, Regency Home Remodeling, at 1 (773) 930-4465.